Cagney plays the anti-Cody Jarrett. In this film, if he reached the top of the world, he'd call his Ma and ask if she needed him to pick up milk on the way home. James Cagney was the Arnold Schwarzenegger of the 1930 & 40's. Now please let me state my case. I know I've got a bit of an uphill battle here, one man being a 6'2" Austrian bodybuilder while the other is a 5'5" tap dancing New Yorker. Starting small, both are male. Score one point for me. And both had very distinctive, oft-impersonated voices (Arnold's movie catch phrases becoming part of his legend, while Cagney's shrugged shoulders followed by a nasally "You dirty rat!" became a staple for hack comics for a good 4 decades, despite never being uttered on screen by the man). Both were iconic figures of their particular time periods in Hollywood. Arnie made his mark in a series of 80's action blockbusters playing monosyllabic tough guys, villains, barbarians, and mercenaries, while Cagney's gangster roles turned him into a post-Depression era superstar. But the most telling similarity between the two is their shifts from the mega-stardom they were enjoying in their respective eras. Schwarzenegger decided to spread his wings a bit in the late 80's and early 90's, trying his hand at light comedies like Twins, Kindergarten Cop, and Junior, with a good degree of success. But once he made this move, his iconic action hero status was lost forever. And despite trying to get it back, age and other interests soon took Arnie away from the set and transformed him into the bespoken, smiling, hand-shaking, baby-kisser that you see at podiums all around the Sacramento area. Cagney, on the other hand, was a song-and-dance man at heart (going back to his vaudeville roots) and he longed for a chance to do it again after so many tough guy roles (that is, after a brief dalliance in politics... ZING! Another similarity!). And in that endeavor he succeeded, starring in his most iconic role, George M. Cohan in 1942's Yankee Doodle Dandy. He won his only Oscar for that role and it's the one that most of his fans associate him with. He did return to his gangster roots in future movies (most notably in 1949's White Heat), but his remaining 20 years in the business never reached those heights again, and he essentially retired in the early 1960's. 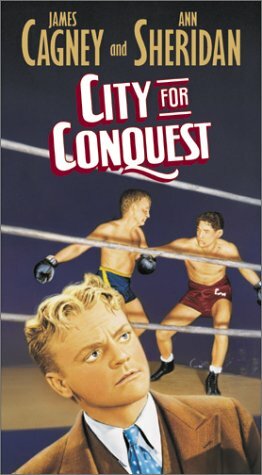 The subject of this review, 1940's City For Conquest, could be viewed as one of the first steps Cagney took in his reinvention. Here he plays Danny Kelly, an inarguably tough guy, but a reticent one. Since he was a little kid, his two best attributes have been his right and his left, but the only time he ever used them were in defense of his gal, Peggy, and his little brother Eddie. He continues to protect these two (played by Ann Sheridan and Arthur Kennedy) as an adult, even to his detriment. He does his best to support his struggling musician brother with delivery work, while he proceeds with the longest courting process in the history of man, failing to get into Peg's mother's good graces into what must be their early 30's. Like Danny's brother, Peggy has aspirations as well. She wants nothing more than to be a famous dancer. Not of the balletic or Broadway sort, but just as a general dancer (an anachronistic goal by today's standards, but apparently just watching people dance back in the 30's was an acceptable pastime and a potentially lucrative employment goal). So Danny puts aside any personal designs (if he has any) and supports these two in their seemingly long odds career ambitions. But eventually Peggy gets a break of sorts at a local dance hall. She's spotted by an established dancer-for-hire, the slick (both in dress and in hair tonic), condescending Murray Burns (played by a startlingly young Anthony Quinn). He offers Peggy a chance to be his dance partner (both in and out of quotes) in a traveling variety show. Peggy has some initial reservations about leaving her man and the comfortable surroundings of NYC, but they're short-lived and she jumps at the chance to head out on the road to build her career as a dancer. Danny is of course happy for her, but he immediately (and rightfully) suspects Murray Burns is trying to move in on his girl. Desperate to get her back (and in need of money to support his brother, who's flagging in his belief that he can make it in music), Danny turns to the only thing he was ever really good at, fighting. And while his heart is never really in it, he quickly becomes one of the best welterweights in the fight game, thrilling the crowds with his raw aggression and eventually making a pretty comfortable living for himself. But it's all done in the name of supporting his brother and a misguided attempt to "win back" Peggy. Odds are, if you've seen ANY romantic dramas from this era, you know where this one is heading. There's bound to be some unforeseen bumps in the road and some tears, but it'll all work itself out in the smaltzy end. Cagney plays Danny Kenny with such a steadfast morality that it seems like he's bucking for sainthood. It's not just a departure from his past tough guy roles; it's a flat out exorcism of them. Ann Sheridan is glowing as Peggy, but you know it's going to end in tears (as it often did for her characters). It's the supporting characters that get the most fun. There's our fully-accredited hobo narrator played by Frank Craven. The tough as nails fight promoter Scotty MacPherson (Donald Crisp) who has the expected heart of gold. Elia Kazan plays a former street tough from the Kenny brothers' past named Googi who becomes an extremely shady financial backer for Danny's boxing career. Along with a host of other tough types (with names like Pinky, Dutch, and Mutt), everyone seems very much at home in this Cagney picture. Everyone, that is, but Cagney. He just wasn't able to sell himself as a goody-two-shoes of THIS degree. Even when he was at his blandest and sweetest, I was expecting him to pull a gun, jam it in someone's ribs, and order them to not make a sound or he'd plug 'em. It just wasn't a good fit for him. The fight action was kind of a mixed bag. Cagney had done some amateur boxing as a younger man, so he looked comfortable in the ring. The fight make-up that they worked up (particularly the trauma that Danny suffers in his last bout) was pretty damn good. And the fight crowds were fantastic, as they usually were for fight films in this time period. It was the fight choreography that was lacking. It had that predictable, stage-y flow to it. Every set of tapping, wrestling body blows was invariably followed by a stiff right cross and a feigned stiffening of the body by the recipient. If each one was followed by an illustrated "BIFF!" or "KA-POW!" (a la the 1960's Batman TV show), it wouldn't have seemed out of place. It looked THAT fake at times. It wasn't just the predictability or the misfire of casting Cagney in such a bland role that left a bad taste in my mouth this time out. If nothing else, this was a movie about ambition. The younger Kenny brother's ambition to play music in front of an adoring crowd. Peggy's ambition to become a famous dancer. And Danny's ambition to.... well, I'm not sure what Danny's ambition was. To keep those that he loved safe? For sure. But is that really an ambition? Or just a means of putting off your own growth? In this movie, it's certainly presented as a virtue, as is the brother's attempts at becoming "somebody". But Peggy's drive to realize her dreams is presented as wrong or selfish. We're led to believe that Peggy shouldn't have taken her chance at stardom and should have been happy to be doted over by the ambitionless Danny. Her eventual guilt-ridden sobs after her career takes a downturn and she finds the down-on-his-luck but never broken Danny at the end of the film are supposed to be some sort of affirmation of her "poor choices". But to me it just felt like a double standard. Thank goodness I wasn't sitting in the theater during this movie's initial theatrical run. If I could have somehow traveled back in time and bought a ticket to the cinema for a matinee showing (after a trolley ride, a shoe shine, and a quick egg cream, all for under a nickel! ), I would have been sitting amongst an angry group of teary-eyed theater goers, screaming at the screen, "DON'T FEEL BAD, PEG! YOU HAD EVERY RIGHT TO LEAVE THAT APATHETIC BUM IN YOUR REARVIEW MIRROR! GO FOR YOURS SISTER!" But maybe I'm not as sentimental as my 1940 counterparts.